The direct connection between obesity and eating too much fast food is well documented. Now comes research showing that consumption of fast food, particularly among young adults and teens, may lead to worsening of conditions such as asthma, allergies and skin conditions such as eczema. Asthma, eczema and other immune disorders are shown to be on the rise in populations of children and teenagers who consume fast food at least three times a week. Getting kids to eat more greens and whole vegetables, especially in substitution for fast food, produces a reduction in risks of allergies, asthma and eczema. But good luck convincing the kids it’s worth it. As you can imagine, kids accustomed to eating fast food or who are pressed for time in their daily schedules are less than enthusiastic about altering their fast food diets. Plus they enjoy the taste of fatty, salty and sugary fast foods over the bland but healthier alternatives mothers might pack in their lunches, if kids would even consider that. That means the fast food generation keeps getting fatter and sicker and now, it is documented, suffering an increase in asthma and allergies. Could it be called an epidemic of fast-food-itis? That depends on your perspective. But the evidence is compelling. A medical publication titled Thorax: The International Journal of Respiratory Medicine produced a report based on studies of more than 500,000 children in 30 different countries, showed that asthma and allergies appeared in at least 39 percent of teenagers who consumed fast food. A study in 2011 showed that these same conditions decreased when children ate vegetables and fruits in their diet. Getting asthma from the inside out? The lesson here is that asthma in many cases may affect people from the “inside out.” Diet has much to do with how healthy you are, and a diet dependent on fast food rich in processed ingredients, chemicals and preservatives clearly has an adverse relationship on the “inside out” health of people young and old. Kids often ignore such connections in favor of living the youthful lifestyle, not watching what they eat over eating for fun or convenience as compared to thinking about food as foundational to health and nutrition. The young mind often cannot see down the road to a life riddled with health problems because of eating habits established while young that lead to asthma, allergies and other health problems. 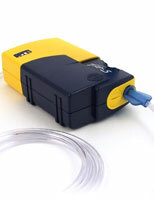 Comes complete with LC Sprint Nebulizer, Multi-voltage AC Adapter and Carrying Case. 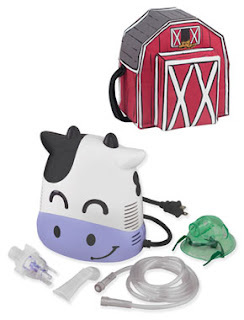 For younger children, the Margo Moo Nebulizer helps children take their medicine with a smile on their face. Efficient and dependable, Margo Moo is convenient and easy to use, comes with a child face mask, angled mouthpiece, medication cup, 7 ft. tubing, 5 air filters and barn-style canvas tote bag with zipper pocket. Everything a parent needs to bring the asthma gear on the road!